A few days ago I wrote an article on a Distimo report comparing various app markets. One of the juicy bits of info from the report (that I didn’t cover in my article) was that precisely 0 of the top ten free apps and 0 of the top ten paid apps on Android are games. 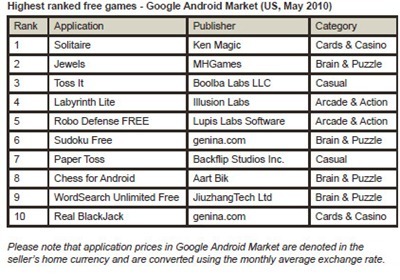 I don’t think you can sanely make an argument that gaming on Android is healthy when there are no games on the top 10 free or top 10 paid apps. That said, good news is on the horizon: OpenFeint, an SDK that allows game developers to add social networking to their games, is coming to Android. Today, the service has over 28 million users, 9,200 developers, over 2,200 games. While OpenFeint joining the rabble may not be the solution, it’s certainly a big step in the right direction – and at this point, every bit helps. Mobile Social Games Network's Expansion to Android will Accompany Titles from Glu Mobile, Digital Chocolate, And Hudson Entertainment. 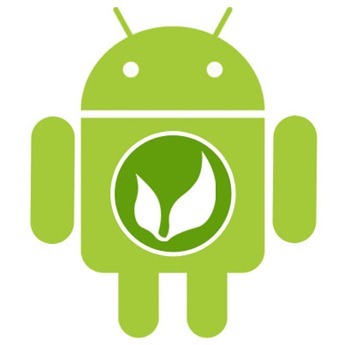 Burlingame, CA – July 8, 2010 – OpenFeint, the leading mobile social gaming ecosystem for iOS devices, today announced that its 9,200 member game developer community with thousands of published games will soon have a complete solution to thrive in the Android apps economy. Launching later this summer, the company's complete solution will include its de facto standard SDK, a game discovery store and mobile payment options. It will also include high quality content from leading publishers Astraware, Digital Chocolate, Glu Mobile, Hudson Soft and independent studios like Distinct Dev (Moron Test), ustwo (Dot Dot Dot), Pik Pok (Flick Kick Football) and RocketCat Games (Hook Champ). With a strong set of partners at launch, OpenFeint's ecosystem provides Android users the most compelling way to discover and buy high quality online games. In addition to incorporating Google Checkout and leading community features into its developer SDK, OpenFeint will extend its wildly successful Game Spotlight discovery app to Android. Interested parties can register atwww.openfeint.com/developers/android for details as they emerge. "This is a big step for OpenFeint and an even bigger step for Android as it becomes a serious mobile gaming platform," said Jonathan Goldberg, Analyst at Deutsche Bank Equity Research. “OpenFeint ushered in mobile online gaming for iOS devices and we think they’ll lead the revolution on Android." "The explosion in mobile online gaming is a phenomenon that affects all members of the mobile ecosystem - from OS developers and OEMs to game developers and players," said Peter Relan, Executive Chairman of Aurora Feint. "Online games are meant to be played with all of your friends - regardless of mobile operating system. We've decided to expand to Android with these mobile gaming giants because all smartphone owners deserve high quality, easy to find games." Aurora Feint Inc's software development kit, OpenFeint, allows game publishers to implement services which enable mobile social gaming. With over 28 million registered users and a presence on over 2,200 games, OpenFeint is the largest mobile social gaming ecosystem for iOS devices and is expanding to Android in late 2010. Aurora Feint is backed by DeNA Inc and The9. Google and Android are trademarks of Google Inc. Use of these trademarks is subject to Google Permissions. Apple and iOS are registered trademarks of Apple, Inc.